Described as a ‘treasure trove’ of Indian classical music, the NCPA Archives has over 5000 hours of music of studio-recorded as well as live performances by the greatest in classical music-both in the Hinduism and Carnatic styles. Maintained for over 4 decades in the most ideal conditions of temperature and humidity, and on the best recording formats, the NCPA Archives preserve and protect India’s rich musical heritage. According to the Artists themselves, the Archives feature some of their best works, recorded at the prime of their careers. This wonderful ‘khazana’ is being presented to the music loving public for the first time. 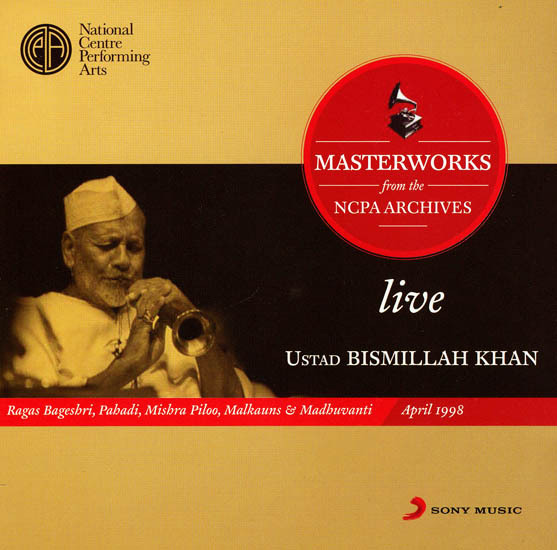 For more than half a century, the sound of the shehnai has evoked only one name: Ustad Bismillah Khan, Unquestionably one of the greatest musicians in history, Khan was the most illustrious ambassador of his instrument. The shehnai was originally a folk instrument-believed by many to have been part of military ensembles – but rich royal patronage enabled court musicians to develop it in the context of Hindustani music. There did exist a well-established tradition of classical shehnai-playing before Khan, but it was his genius that transformed the instrument into a vehicle of nuanced musical expression. After his first recital in Kolkata (then Calcutta) in 1937 at the All India Music Conference, what was often perceived as a limited instrument, was suddenly revealed to contain all the vast possibilities of Hindustani music. A lack of prominent practitioners had relegated the shehnai to the category of a ‘wedding instrument’ in popular perception. (Traditionally, North Indian weddings had a shehnai player performing live to welcome guests.) Khan compelled listeners to reconsider this notion and accept the shehnai within the serious performance space of Hindustani music. Khan was born in Dumraon in Bihar and moved to Varanasi when he was six. He remained in his beloved Banaras till his death in 2006. The love affair between the maestro and the city is part of Hindustani music folklore (‘Bana banaya ras-Banaras’, he used to say). This is touchingly expressed in Khan’s regular practice of accompanying the arati at the Balaji temple in Varanasi with his shehnai. He trained under his uncle Ustad Ali Baksh. Baksh adopted a unique method to teach his young nephew. In addition to the regular lessons, he forced Khan to reproduce whatever he heard in a concert, be it vocal or instrumental, on the shehnai. In interviews, Khan often said that his uncle was so inflexible about this practice that he eventually started staying away from concerts to avoid these tests. But the tests had a profound impact in Khan’s making as a maestro. His musical idiom was an amalgam of various vocal and instrumental influences. His playing style was characterized by rich variety and was unlike anything listeners had heard before. His shehnai was capable of capturing the most nuanced of aspects from the gayaki ang as well as the robust dir dir patterns of plucked instruments like the sarod and the sitar. His repertoire ranged from grand ragas like Behag and Multani to playful dhuns and chaitis. Khan had played at the Red Fort on the eve of India’s independence on 14 August 1947. He was awarded the Bharat Ratna, India’s highest civilian honour, in 2001. This is a relatively short rendition – about 23 minutes-of this late-night melody that artistes usually explore over a longer span. Khan needs only a few notes to pierce the soul of the raga, which he brings to life with his first glide from madhyam to komal gandhar. He plays a couple of phrases by way of an aochar (short alap) and launches into a medium tempo composition set in Jhaaptal. The sam of the composition is on a madhyam-komal gandhar glide. This being one of the pivotal phrases of the raga, its recurrence keep the listener firmly within its melodic web. The vistaar around the composition mainly comprises long meends, through which the plaintive shudh madhyam is adequately projected. Within the 10th minute of the track, Khan switches to a drut composition in Teental. The composition is one meant for plucked instruments-with dir dir patterns – and provides a stark contrast to the gayaki-style vistaar around the Jhaaptal composition. Khan’s characteristic staccato movements – often evocative of semi-classical and folk genres-embellish the composition, which culminates with the maestro indulging his accompanying son to finish off with a robust tabla solo. Khan was a master of the semi classical genres that flowered in the eastern region of Uttar Pradesh, commonly known as the Purab Ang repertoire. In this track, he performs a Dadra. Strictly speaking, Dadra is the name of a six-beat rhythm cycle, but through convention, the semi-classical vocal compositions set to this taal are also referred to as Dadras. Raga Pahadi has its origins in folk music and, unlike many other ragas in Hindustani music that have similar roots, it maintains the folk flavor. The rhythm pattern of the Dadra beat is particularly suited to the earthy melodic structures of the raga. Khan’s rendition is exemplary of the marriage between the lilt of Pahadi and the sway of Dadra. Being relatively limited in scope, foreign notes are often introduced into the raga (an acceptable indulgence in light-classical music). Khan does so with ingenuity and to great effect, of which the thunderous applause, after his innovation with foreign notes in the 9th minute, is evidence. The maestro plays a composition in Keharva (4 beats). The vibrancy of the composition is heightened by his first use of the komal gandhar, after which he delightfully anchors his improvisations around both gandhars to bring out the colours of Pilu. A few phrases of vistaar are followed by Khan’s characteristic staccato movements in keeping with the 2-2 rhythm cycle of Keharva. Khan then presents a riveting passage composed of short and fast movements in the tappa style, his shehnai moving through the intricate patterns as effortlessly as the human voice. This is a short presentation of raga that the maestro has performed more expansively in several recordings and performances. Few other maestros have unfurled the possibilities of Malkauns like Khan has-each of his renditions presents this late-night raga in a new light. In this track, Khan begins with an aochar, elaborating on the key notes komal dhaivat and komal nishad. After that, he begins a familiar drut composition in Teental. Over time, this composition has become synonymous with ‘the Bismillah Malkauns’ (not least because of its unfortunate overuse in weddings). In this instance, the maestro develops the composition through an eclectic mix meends, staccato laykari, tans and tihais. The elements are not presented in any linear sequence and the crisscrossing heightens the spontaneity of the performance. Khan’s son, Nazeem Hussain, is given generous windows to play solos on the tabla. This is an exhaustive exposition of the late afternoon raga. The track begins with an aochar of about 4 minutes. But this short span is enough for Khan to establish the mood of the raga with emphasis on teevra madhyam and pancham. Khan then launches into a composition in vimalbit Teental. The sam of the composition is on shuddh rishabh, which is immediately effective in differentiating the raga from its allied raga Multani, which uses komal rishabh. A short vistaar, in which teevra madhyam is again highlighted, is followed by an extended section of slow, then fast gamarks. The maestro goes on to create contrast by introducing staccato elements into the gamak passages and heightens the contras by following the fast gamak-based tans with long-winding vistaar phrases. The best example of his play with contrast can be found between 24:38 and 25:27 of the track: in less than a minute, a spurt of fast tans segues into a playful staccato movement before finally being rounded off with an extended meend traversing the avaroh of the raga. The spontaneous applause of the audience, preserved in the track, is telling of the impact. The drut composition is also set in Teentaal and opens with a long tabla solo piece. Khan’s improvisations in the drut section are characterized by elements of laykari using his ever-popular staccato movements woven around short melodic spans and dir dir patterns that are evocative of the sarod and the sitar. The piece ends with a jhala, again using instrumental patterns with great effect. The track is exemplary of the maestro’s equal command over both the gayaki and tantrakari angs. Khan was a colourful speaker and often peppered his recitals with witty quips and anecdotes. While performing in Kolkata once, he stopped to say, “Kolkata aur Madras mein log sabse achha sunte hain.” There was thunderous applause. He waited for the applause to die and then, with immaculate timing, and a chuckle, he added, “Lekin kalakar paida hoten hain UP mein”. His sense of humour is on display in this short speech, in which he expunds on the notion that Hindusani music cannot be bought for money. To say more would be to spoil the fun of listening to the maestro speaking in his inimitable style.